Boneless Skinless Chicken Breast is the tender white meat cut from the chest of the bird, with the tenderloin removed. It cooks quickly, and is a favorite for protein-rich lunches with a side salad. ButcherBox Chicken Breasts are free-range organic, meaning that their flavor is clean yet satisfying – making them fantastic in a chicken salad, or served over noodles. 2. Place Boneless Skinless Chicken Breast at 45° angle across hottest part of grill grates, then grill for 6 min, while rotating 90° every 3 min. Keep your chicken moving to ensure that it cooks evenly. 3. Move chicken to cooler part of the grill, then grill for 10 min while rotating 90° every 2-3 min. Remove from grill when meat thermometer inserted into thickest part of thigh reads 165°F. 2. 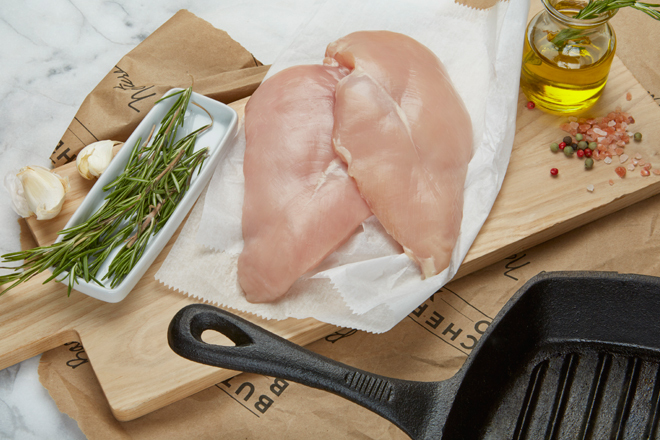 Place Boneless Skinless Chicken Breast on sheet pan. Roast in oven for 25 min, or until meat thermometer inserted into thickest part of the thigh reads 165°F. Remove from oven.